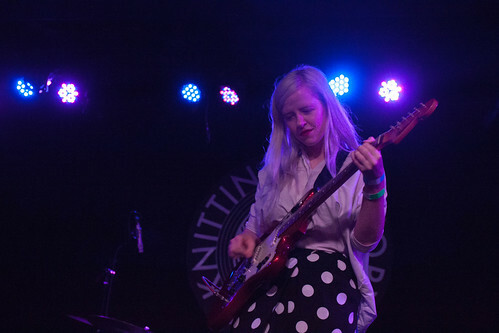 With the release of her 2016 debut, Fading Light, Dutch singer/songwriter and musician Annelotte de Graaf quickly received international attention for her solo recording project Amber Arcades, a project that thematically drew from a variety of esoteric and familiar subjects — time and the relativistic experience of it, jet leg and her own dreams; in fact, following her own dreams has informed much of the Dutch singer/songwriter’s personal and creative life. Because she had always dreamt of working for the UN, de Graaf worked her way into a position as a legal aide on a UN war crime tribunal and human rights law, assisting Syrian refugees. She also used her life savings for a flight to NYC and studio time to record her debut with Ben Greenberg, who has worked with The Men, Beach Fossils and Destruction Unit, and a studio backing band that included Quilt’s Shane Butler (guitar) and Keven Lareau (bass) and Real Esate’s Jackson Pollis (drums). Building upon the buzz that she received for Fading Lines and a Fall 2016 tour with renowned indie rock act Nada Surf, de Graaf will be releasing her debut’s highly-anticipated follow up Cannonball on June 2, 2017 and the EP will include the propulsive “It Changes,” a single that reveals a decided change in sonic direction for the Dutch singer/songwriter, as the song manages to sound as though it draws from post-punk and garage rock, thanks in part to angular guitar chords played through effects pedals and an anthemic hook paired with de Graaf’s crooning. As de Graaf explains in press notes, the song is ultimately about life’s temporal nature. “Everything changes, all the time,” de Graaf says in press notes. “You think that when starting something new you can kinda tell which way it will go, but you never do. I always try to aim for constancy and stability but things always get messier than I foresaw. And hey, maybe that’s actually what makes it worthwhile.” As a result, while the song possesses a hopeful yet realistic take on life; suggesting that the recognition of messiness and uncertainty being a part of life and something you can learn from. Created by Ben Clarkson, the recently released lyric video features psychedelic-leaning animation depicting the passage of time superimposed over neon-treated negatives of a variety of imagery including a woman playing at the beach, the icy North Atlantic Ocean, spinning tops, couples holding hands and so on, along with bursts of the song’s lyrics. It emphasizes the song’s central theme while being a little mischievous.